MOSCOW, Russia -- The amount Russia says it is owed by Ukraine’s cash-strapped government for natural gas has ballooned as if by magic — from $1.7 billion at the beginning of April to a staggering $35.4 billion, according to a letter sent by President Vladimir Putin this week to 18 European leaders. Russian President Vladimir Putin speaks at a Cabinet meeting in the Novo-Ogaryovo residence outside Moscow, Wednesday, April 9, 2014. President Vladimir Putin has threatened that Russia’s state-owned gas company could ask Ukraine to pay for gas in advance, according to Russian state news agencies. Here’s a look at how Moscow got those figures, and what options Ukraine has. On April 1, Alexei Miller, the head of Russia’s energy giant Gazprom, estimated that Ukraine owed $1.7 billion in unpaid gas bills to Russia. Two days later, Miller added $500 million more for unpaid gas supplies in March. Gazprom then announced it would be scrapping all gas discounts, meaning an 80 percent price hike that would further increase the debt in coming months. The bill further increased after Russia moved to annul agreements with Kiev on Russia’s navy base in the Crimean Peninsula, which Russia annexed in March. In 2010, Ukraine extended the lease of the base for an annual rent and discounts on gas, but Moscow revoked that agreement after Crimea effectively became Russian territory. Now Moscow says Ukraine owes it $11.4 billion in gas discounts given in advance for the base. In his letter on Thursday, Putin said that the gas-related debt was actually $17 billion, although it’s unclear how he reached that figure. He also said Ukraine owed Russia an additional $18.4 billion in past fines on its gas contracts. The contracts, called take-or-pay, say Ukraine has to pay for all the gas it imports for domestic use, whether it actually uses it or not. 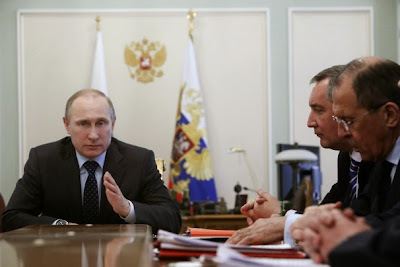 Putin then mentioned $3 billion Russia loaned Ukraine in December, bringing the grand total to $38.4 billion. “It’s kind of like the drug dealer and the addict here. The Russians kept lending (Ukraine) money and knowing they’re not going to pay,” said Andrew Neff, an analyst at IHS Energy. The money Russia is demanding is far greater than the $14 billion to $18 billion bailout expected from the International Monetary Fund over two years. It would also exceed the $15 billion the European Union has said it will help with. Analysts like Valery Nesterov, of Sberbank CIB, warn that Putin’s figures should not be taken at face value. But if relations worsen, Moscow could push for repayment of some of that money, and Ukraine would be in trouble. Ukraine will try to get some money from its own citizens — it will hike domestic gas prices by 50 percent on May 1. But that will not raise any new money, as it will barely match the gas price hike Russia made. Ukraine’s options are limited at this point. Kiev could sue Gazprom in an international arbitration court for retroactively annulling the Black Sea navy base deal. Ukraine has said it was considering legal action. But going to court could open a Pandora’s box of litigation: Russia and Ukraine have bickered over gas and finances for years, and many previous debts have been swept under the rug or settled out of court. The finances and politics of the two neighboring countries have been so entwined that Russia has countless scores that it could settle, if Ukraine chose to take the legal path. If desperate, Ukraine could opt to sell the pipeline system that brings gas across its territory from Russia to Europe. Moscow has coveted the pipeline for years, making multiple offers to buy it to settle Ukraine’s debts. But for Ukrainian politicians, the idea of selling the pipeline has so far been unpalatable. “The Ukrainians have made the pipeline system into this national strategic asset that is a symbol of sovereignty,” said Neff. In the end, Ukraine will most likely have to call Russia’s bluff and hope it will accept to be repaid little by little. Experts say that considering Ukraine’s cash problem, Russia is likely to be realistic about the issue if it wants to get its money back at all.